LINIÈRES-BOUTON, France -- When prefabricated tract houses and modern office buildings began springing up amid the châteaux and stone cottages in his adopted Loire Valley, Jonathan Robinson was horrified. Robinson, 53, an artist who grew up rough on Chicago's South Side, had fled the United States to escape the spread of strip mall architecture, which he says brought literal pain to his eyes. He calls himself an ''aesthetic refugee." So from his painstakingly renovated 19th-century water mill that he has turned into an elegant inn in the Loire's Anjou region, the expatriate Robinson has formed a grass-roots organization, Association MB, to preserve traditional architecture in France. Robinson never intended to do anything more than continue painting (his work has been shown in some of the world's most prestigious galleries, from New York to Cologne) and transform his old wreck of a mill, Le Moulin Brégeon, into a luxurious compound of traditional buildings for visiting Francophiles. But watching his beloved France succumb to what Robinson considers the worst of modernism spurred him into action. ''A bell jar made of glass, cement, and steel is descending on France," Robinson said. ''It's going to suffocate the visual beauty and poetry of the country." The defense of France is as important as fighting for the Amazon rain forest, Robinson insists. ''France represents a biodiversity of beauty. The French really thought about the idea of beauty, with all their senses. You see it in their food, their wine, their architecture, their furniture. They even manipulated their language so it would sound pleasing to the ear. And I see it being erased," he said. Surprisingly, Robinson's passion has struck a chord among the notoriously imperious French. ''We urge him on and we're behind him," says Dominique Tronca, 47, an Association MB member who belongs to a six-centuries-old artisan guild and specializes in traditional woodworking. ''He has the passion to speak up that we don't have. We think our way of life is coming to an end but we don't know what to do about it." 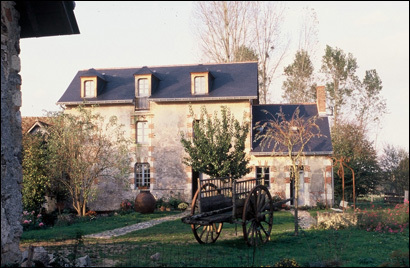 Guests at Le Moulin Brégeon cannot help but absorb some of the proprietor's passion for French tradition and culture. The mill, which has five guest suites with private bathrooms, sits on 20 acres of streams, gardens, trails, and bike paths in the middle of quiet countryside, miles from town. The mill was rebuilt in the 19th century, but when Robinson began renovations, he found traces of an old monastery beneath the foundation dating to the 15th century. Guests eat dinner every night in a candlelit dining room next to the old paddle wheel of the mill or al fresco, depending on the season. It is usually a six-course gourmet meal cooked by Pascal Merillou, a Frenchman and one of Robinson's business partners, with ingredients from the nearby market and vegetables from the mill's organic garden. During dinner Robinson points out details at the Moulin that the average person might not notice, like the ''perfect symmetry" of the 300-year-old wooden door in the dining room, and a small decorative iron handle on another door. ''This was just a simple industrial building, but the blacksmith who made this handle obviously took pleasure in embellishing it by adding certain elements," Robinson said. ''Whether it was the stoneworker or the woodworker, they all added little eye-pleasures. It felt artistic to them. It was all about participating in a culture of beauty." Many of the mill's beautiful antique beds, sofas, and chairs were discovered at local flea markets, or in some cases rescued from the street and lovingly refurbished. During the day, Robinson, Merillou, and a third partner, Bernard Levenez, take guests on customized tours of antique shops, wine caves, swimming lakes, and restaurants known only to locals. In the mornings, there are boulangeries and market stalls laden with asparagus, strawberries, cherries, pears, and plums; in the afternoons, the wine caverns featuring the honey-and-quince flavored wine, Coteaux du Layon; and world-class red appellations, Saumur Rouge and Saumur Champigny. The famous Paris mushrooms grow here; a mushroom museum explains the lore. And there are châteaux nearby. Saumur Castle, a rare example of 14th-century architecture (which marked the end of the Middle Ages and the beginning of the Renaissance), is illuminated by floodlights for evening tours. Châteaux d'Ussé is the fairy-tale setting that inspired Charles Perrault's ''Sleeping Beauty." Chinon, a village of checkerboard canals, is where Joan of Arc met with Charles VII to assume military power. Robinson, Merillou, and Levenez also offer weeklong programs in French language, history of French art and architecture, and cooking and pastry-making. They also have facilities for yoga programs, and offer ''adventure weeks," which consist of low-calorie organic food and daily hikes. Two years ago, they began holding weddings for special guests. But the biggest draw at Le Moulin Brégeon is meeting Robinson and spending time with him. Equal parts dogmatic and charismatic, he has become a notorious yet beloved figure in the area, fighting with Paris-based architects, battling politicians in Saumur, the main city in the Loire, and showing US tourists what he sees as particularly egregious examples of aesthetic blight in the countryside. The mere sight of a garage door attached to an old stone villa near Noyant sends him into a tirade. But Robinson is at his best when telling of how he rehabbed the mill, preserving the original crepe facade on the stone walls, the millstone, and gears. Le Moulin Brégeon was in ruins, having been abandoned in the 1970s, when modern machines finally replaced the wheat-grinding paddle wheels. There were broken windows, collapsing roofs, blackened walls, a kitchen full of old wine barrels and cobwebs, stained floors, and rooms filled with old grain sacks. But Robinson, who says he lived in 10 foster homes starting when he was 2, and survived serious physical abuse in several of them, was undaunted. An itinerant named Rene was squatting in the old mill, along with his seven donkeys. Robinson let him stay on for several years. ''I was just in heaven after I took possession of the place," he recalled. ''I began creating my garden, we were all cutting hay, we sat by the river and looked at the sky. All the elements were there. It was a little what I imagine France was like centuries ago, when there was no technology, no pollution, and no visual flash to hurt your eyes." The three partners renovated the mill with the help of local craftsmen, who train for five years and apprentice for two, and have become their friends. They learn styles of working in stone and wood dating to the 15th century. Robinson, who scours local antique stores and flea markets for items like 19th-century decorative radiators, can go on for hours about one stone window frame in the guest cottage at the mill, which was handcarved in a style dating to the Renaissance. Robinson recently purchased all the buildings in the village, which were abandoned about 20 years ago when local residents started going to larger towns to shop. He now owns the remains of an old dry goods store, a blacksmith's shop still crammed with all its original tools, and even a type of bowling alley. He bought the buildings, he said, to make sure they are not razed in favor of new, modern structures. ''The French people are being hounded to modernize," Robinson said. ''My dream is to help them preserve their traditions. The kind of beauty you see in the Loire Valley is . . . a different kind of pleasure because it's enriching to all the senses." Contact Dana Kennedy, a freelance writer in New York, at dkennedy@aol.com.